FederalÂ re-licensingÂ is underway for two of the major hydropower facilities in the Upper Valley Region. Water quality, river flow levels, recreational activity, shoreline stability, and aquatic life are affected by the presence of the dams on our major rivers. Now is the time to examine the positive and negative impacts of hydropower generation and carefully plan for future operations. Next week begins a series of public meetings to provide opportunities for comment on the studies proposed by dam-owner TransCanada Hydro Northeast as part of theÂ re-licensingÂ process. 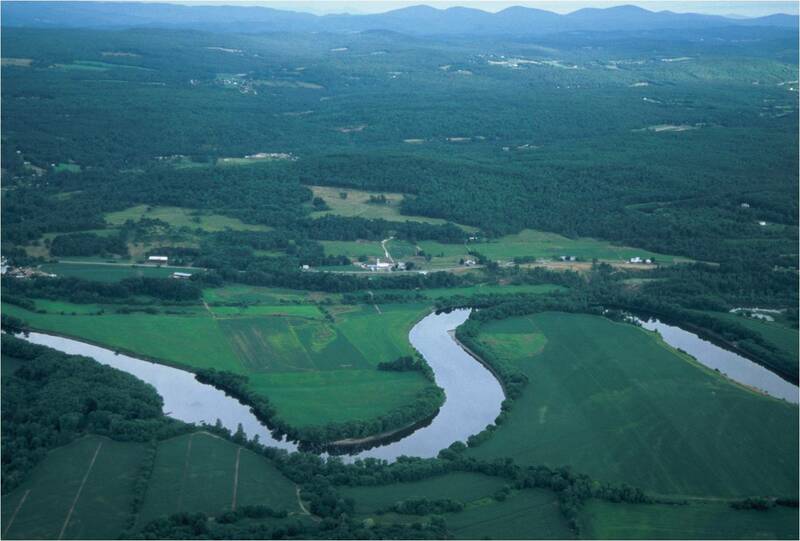 UVLT conserved farmland on both sides of the Connecticut River in Newbury and Haverhill (photo credit: John Rush). Operation of the Wilder dam – which lies nearly 45 miles south of these properties – has influence on the river ecology, farm practices, water quality, soil erosion, and recreational opportunities even this far north. TransCanada owns the Wilder, Bellows Falls, and Vernon Dams in Vermont. Â Your input will help to determine what studies TransCanada will conduct to examine the impacts of dam operations on the river. The results of these studies will provide information to the Federal Energy Regulatory Commission (FERC) which determines the regulations for the next 30-50 years of dam operations. TransCanada will host an initial overview meeting 9:00 a.m. – 4:00 p.m. Monday, May 13 at the Kilton Library in West Lebanon, NH to review its Proposed Study Plan â€“ this meeting will be the most useful if you are interested in learning about the general approach and breadth of scope of the many proposed studies. Follow-up meetings will cover specific studies on topics like recreation, shoreline erosion, water quality, fish habitat, and river flows. Don’t miss this chance to learn about the studies that will begin soon after the series of public meetings concludes, and share your thoughts and concerns. Â Comments are due by July 15. To register for a meeting visit the TransCanadaÂ re licensingÂ website. For specific information on the projects in our region, go directly to the pages for the Wilder DamÂ and Bellows Falls DamÂ where you can find documents and search for upcoming meetings.Â Additionally, the Proposed Study Plan, as well as comments from stakeholders and responses from TransCanada are available online via the FERC website. The Upper Valley Land Trust has been a participant in public meetings held earlier this year and has submitted endorsements for studiesÂ of the impacts of dam operations to natural resources in our region.Â UVLT will continue to track the process throughÂ re-licensingÂ â€“ please contact usÂ if you would like to learn more about being involved. Date & Time: Monday, May 13, 2013 at 9:00 a.m. – 4:00 p.m. NOTE: The primary goal of this meeting is to review all study plans, set up and identify resource groups that would participate in the subsequent meetings. Time for questions will be limited. Date & Time: Thursday, May 16, 2013 at 9:00 a.m. – 4:00 p.m. Date & Time: Monday, May 20, 2013 at 9:00 a.m. – 4:00 p.m. Date & Time: Thursday, May 23, 2013 at 9:00 a.m. – 4:00 p.m. Date & Time: Thursday, June 6, 2013 at 9:00 a.m. – 4:00 p.m. Date & Time: Friday, June 7, 2013 at 9:00 a.m. – 4:00 p.m.